Placide Majambo Lutumba Petit loves his job. You can see the joy in his eyes whenever he talks about the people of his parish. In Mapuordit, a rural area of Rumbek South Sudan, Fr. Placide cares for more than 5,000 Catholics at St. Josephine Bakhita parish. While much of South Sudan has been ravaged by war the past three years, Mapuordit, located in the center of the country has remained relatively peaceful. Fr. 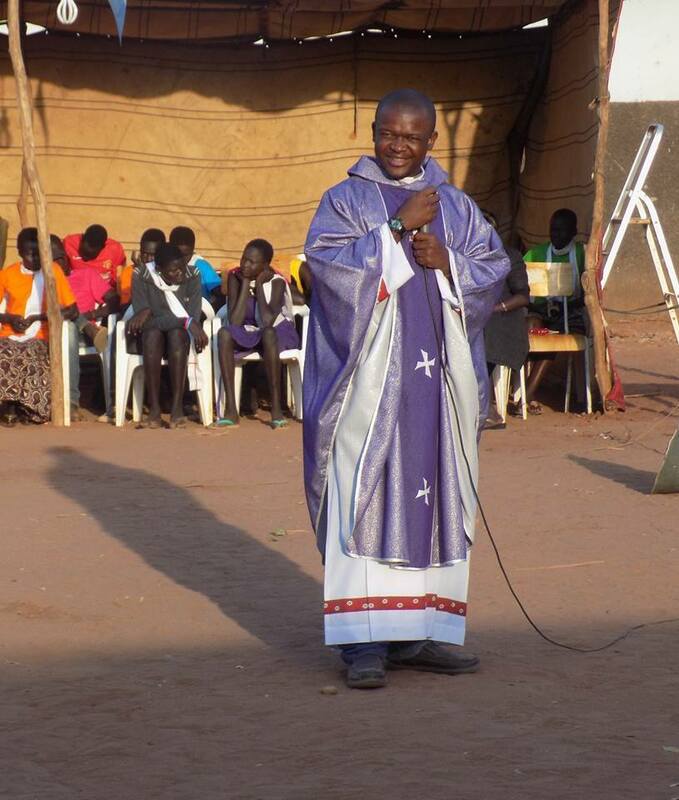 Placide accompanies the youth and the Dinka Christian communities in the parish by teaching them evangelical Catholic values, especially in the areas of health and education, with an emphasis on peace, justice, and the promotion of reconciliation. Even though war hasn’t crept into this little village, the hunger from famine and drought looms large. The nearest city, Rumbek, is nearly 80 kilometers (50 miles) away. Even if the people can get to Rumbek, they might come home empty handed. Because of the country’s fiscal crisis, civil war, and famine, food at the market is scarce and often priced too high. The parish of St. Josephine Bakhita is a safe haven for the people of Mapuordit. The parish boasts three schools, a Girl’s Center, and feeding program. The schools care for children in nursery, primary, and secondary grades. There are also 37 satellite schools run by the government. The church helps purchase supplies and pay the teachers’ salaries, even for these schools. To attend school, families are supposed to pay a $12 tuition fee. While this may not sound like a lot, it is often out of reach for most families that are struggling just to find food and water. After the war started in 2013, many displaced people settled in Mapuordit. These people have no source of income, so the parish tries to help as much as possible. The biggest obstacle when it comes to education, however, is changing people’s perception of girls going to school. Often time young girls are seen as a commodity, they are prized for how many cattle they can get in exchange for marriage. That is beginning to change thanks to a program started by the Sisters of Mercy Beyond Borders. They run a Parish Girl’s Center where girls can attend school, get supplies, and even items like bikes to help them get to school. Fr. Placide firmly believes women will bring great change to the community. Once a girl is able to get a full education, she will often return to the village as a teacher, nurse, and more. One of the most successful programs in Mapuordit is the feeding program supported by the Comboni Missionaries North American Province – lovingly referred to as the NAP. This program supplies life-giving, nourishing food for thousands of families every year. Without it, many people would go hungry. “The people of the area refer to NAP as food, that’s how important it is,” Fr. Placide said. Fr. Placide’s journey to the missionary priesthood started at a young age. “I always felt my vocation was to serve – to be a missionary,” he said. During his youth in the Democratic Republic of Congo, Placide’s mother provided a strong foundation for his Catholic faith. When he decided to become a priest, Placide’s father was disappointed. Despite that, Placide went on to join the Comboni Missionaries in 2003. When he was ordained on October 26, 2014, Placide’s father was there. He finally recognized the importance of Placide’s calling and was proud of his son. Placide’s first assignment was to South Sudan, where he serves now. During his ministry in 2015 Fr. Placide was shot in the back during an attempted robbery on the road. When telling this story, Placide is quick to remind everyone that the people of South Sudan are good people. Bad things happen all over the world. He was just in the wrong place at the wrong time. The bullet entered his back, and just barely missed his spine. When viewing the x-rays, it looks as though the bullet just hopped right over his spine. It was a miracle. After a successful surgery in Kenya and a period of recovery in his home country of Congo, Fr. Placide was eager to get back to his mission and his people in Mapuordit. He serves there today, with a joyful heart and bright hope for the future.